Messier 47 (M47) is a bright open star cluster located in the southern constellation Puppis. The cluster lies at a distance of 1,600 light years from Earth and has an apparent magnitude of 4.2. It has the designation NGC 2422 in the New General Catalogue. Messier 47 occupies an area of 30 arc minutes of apparent sky, corresponding to a linear diameter of 12 light years. The cluster’s apparent size is roughly the same as that of the full Moon. Its estimated age is 78 million years. The cluster is visible to the naked eye in dark, clear skies and appears as a hazy patch of nebulosity. Messier 47 is quite easy to find as it is positioned 12 degrees to the east and 2 degrees to the north of Sirius, the brightest star in the sky, located in the constellation Canis Major. The cluster can also be found about 5 degrees south of Alpha Monocerotis, an orange giant in the constellation Monoceros, the Unicorn. The cluster is easily resolved in 10×50 binoculars, which reveal its brightest stars. Larger binoculars and small telescopes show many dimmer stars in M47, while 6-inch telescopes reveal a loose cluster with many bright and faint stars spread across an area 30 arc minutes in diameter. 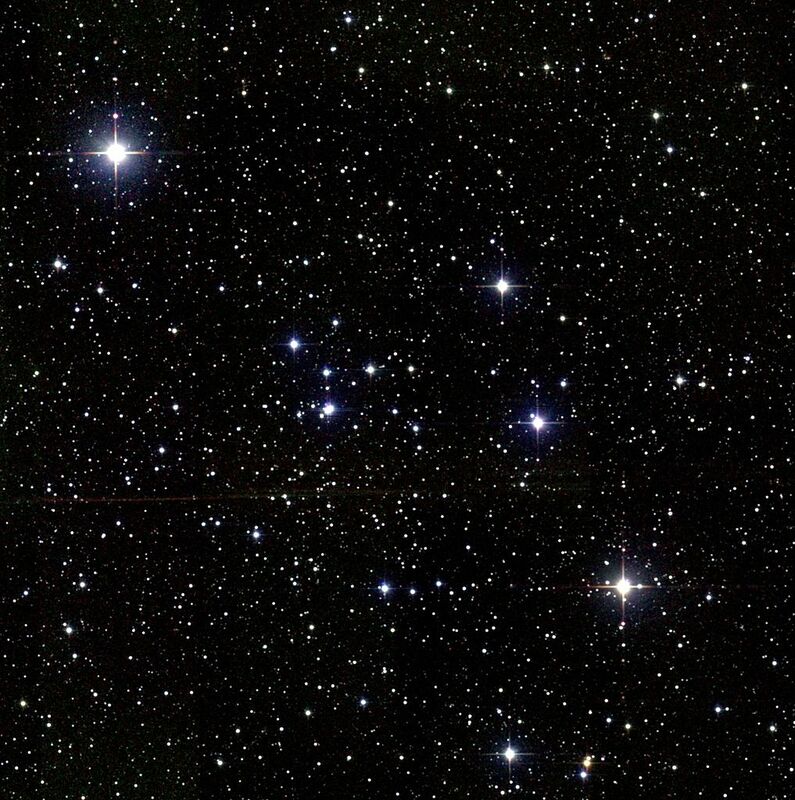 The cluster is located close to Messier 46, a considerably older and more distant open cluster. M46 has significantly more stars, but appears much dimmer because it lies at a greater distance from Earth. 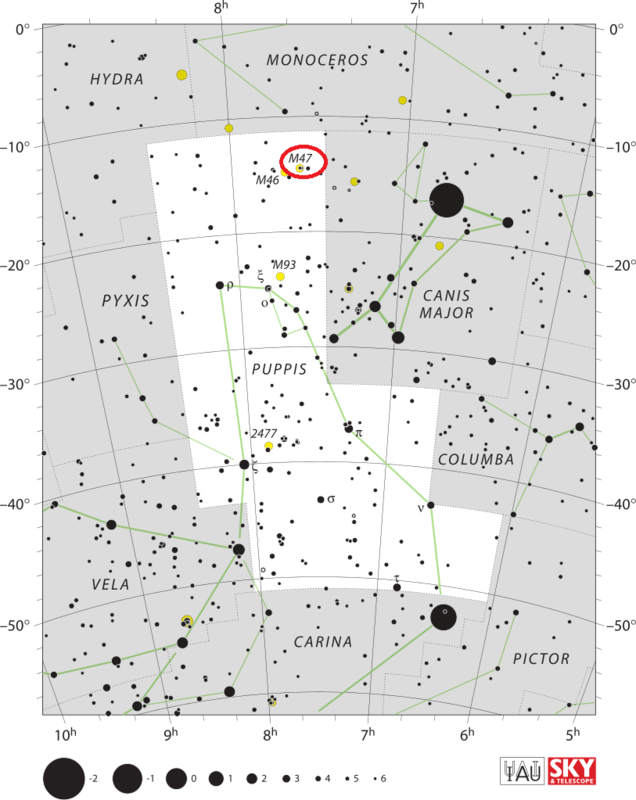 M46 lies about a degree to the southeast of M47. The two clusters can be seen in the same field of view in binoculars and small telescopes. Another cluster, NGC 2423, which lies just 0.5 degrees north of M47, is also visible in the same view. Messier 47 contains about 50 members, which makes it one of the least densely populated open clusters known. 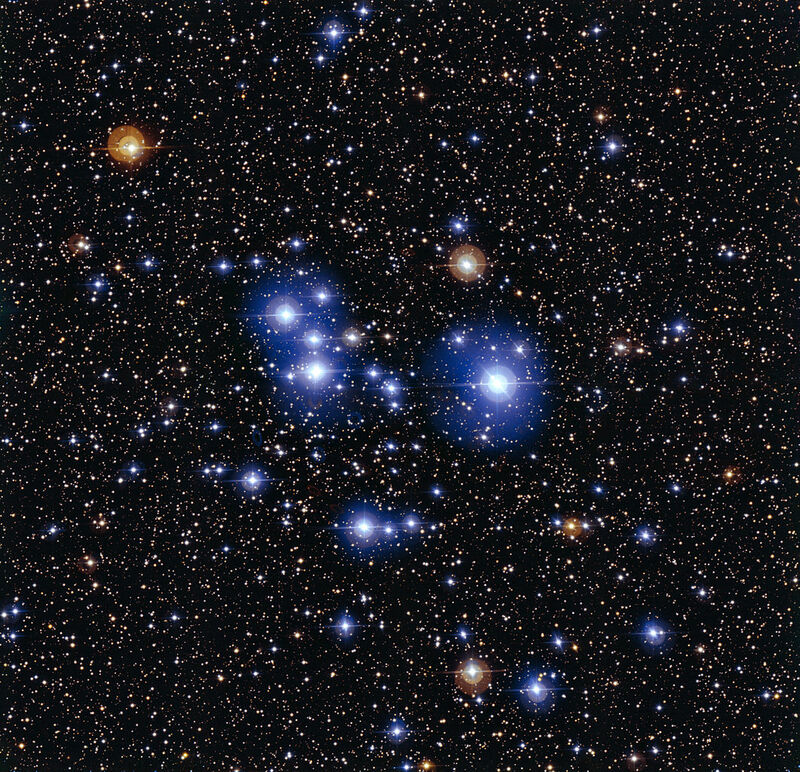 The cluster contains many luminous blue stars and a few older red giants. The brightest stars in M47 have a visual magnitude of 5.7. The single brightest star in the cluster is of the spectral type B2. The cluster also contains two K-type orange giants, each about 200 times more luminous than the Sun. A close binary star, Sigma 1121, lies near the centre of M47. It is composed of two magnitude 7.9 stars that are separated by 7.4 arc seconds. Messier 47. Atlas Image mosaic obtained as part of the Two Micron All Sky Survey (2MASS), a joint project of the University of Massachusetts and the Infrared Processing and Analysis Center/California Institute of Technology, funded by the National Aeronautics and Space Administration and the National Science Foundation. Messier 47 has a density of about 16 stars per cubic parsec in the central region and the overall average density of just 0.62 stars per cubic parsec. The cluster is receding from us at 9 km/s. The cluster was discovered by the Italian astronomer Giovanni Battista Hodierna before 1654. Hodierna described it as “a Nebulosa between the two dogs.” His discovery, however, did not come to light until the 1980s because his work was largely forgotten for a few centuries. There is no cluster at the coordinates provided by Messier, but the position corresponds to that of the open cluster NGC 2422. M47 was considered a lost Messier object before the Canadian astronomer T. F. Morris discovered that Messier’s 47th catalogue entry and NGC 2422 were the same cluster. 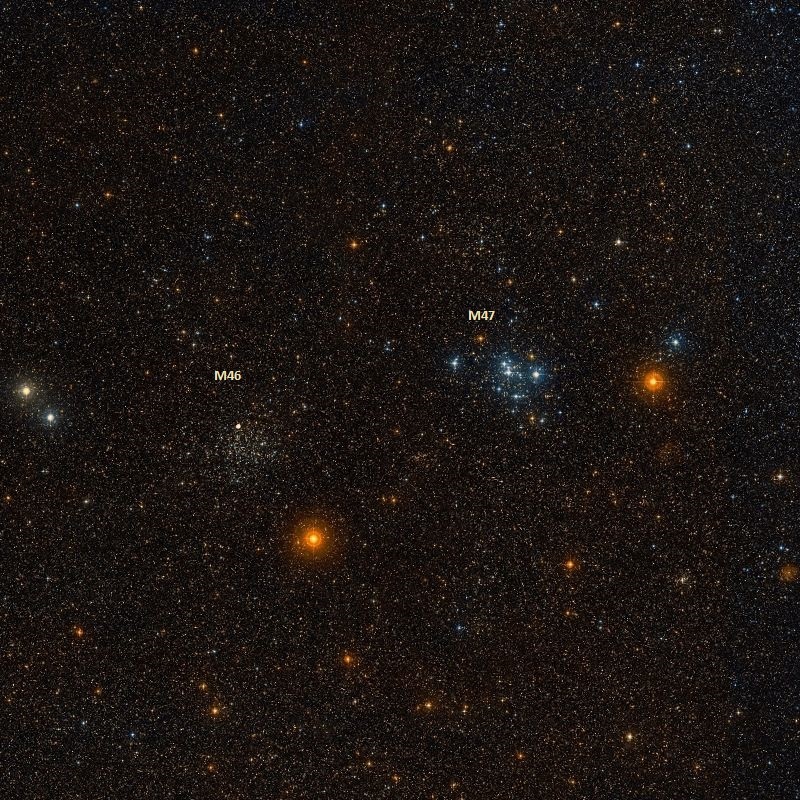 Morris also identified the missing Messier 48. More explicit reasons for this identification [of M47 with NGC 2422] were given independently in 1959 by T.F. Morris, a member of the Messier Club of the Royal Astronomical Society of Canada’s Montreal Centre. Dr. Morris suggested that an error in signs in the difference between M47 and the comparison star could account for the position. Messier determined the declination of a nebula or cluster by measuring the difference between the object and a comparison star of known declination. The right ascension could be found by recording the times at which the object and the star drifted across a central wire in his telescope’s field; the time interval gives the difference in right ascension. The differences between Messier’s 1770 [actually 1771] position for M47 and his stated comparison star, 2 Navis (now 2 Puppis), if applied with opposite signs, leads to NGC 2422. Clearly, Messier made a mistake in computation! In spite of Messier’s erroneous coordinates, Caroline Herschel was able to identify M47 on more than one occasion in 1783.